If you look up the definition of 'war' in the Oxford English Dictionary you will learn that it is "a state of armed conflict between different countries or different groups within a country." The famous military theoretician Carl Von Clausewitz notoriously described war as "the continuation of politics by other means." I have no doubt that at the forefront of Clausewitz’s mind was the form of war defined above by Oxford when he pronounced his aphorism, however I believe that his view of war can be just as perfectly applied to a form that does not include armed conflict, but instead relies on acts of economic aggression to achieve its aims. 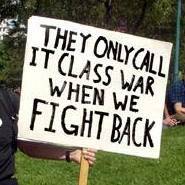 The war that I am speaking of is of course class war, and it is occurring all around us. The ongoing crisis of capitalism has exposed in vivid clarity just what a class war looks like. It involves the capitalist class aggressively fighting to maintain its strategic position in society, with the working class being beaten down by the effects of the buzzword of 2010, 'austerity.' The lack of recognition in the mainstream media that this class war is occurring is the result of the propaganda assault that the political agents of the capitalist class in national governments and supra-national organisations, such as the IMF an ECB, have been waging on a daily basis. 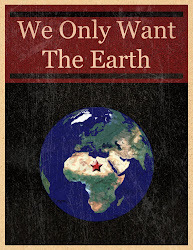 Their mantra harks back to the era of Thatcher and Reagan, with their slogan of "there is no alternative". The result has had the effect of normalising the economic war that is going on around us, and disguised the true nature and intent of it. Article 2 of the UN Convention prohibits the threat or use of force, and the prohibition of the threat or use of economic coercion has been included in subsequent amendments. However, the threats of economic Armageddon that have been fostered on the working class from the agents of capitalism, unless they accept the burden of bondholder debt, are commonplace and without mention. We are led to believe that if we do not shoulder the burden of the debt and default, a dystopia of cashless ATM's and rummaging through bins awaits us. It is through these threats that the capitalist class have kept the working class scared and subservient to its economic agenda. But all of this is just words, what is the evidence of this class warfare I hear you say. Let me provide you with some facts. In Britain, at the height of the financial crisis the 1,000 richest people increased their collective wealth by 18 percent in the past year and are now worth 395.8 billion pounds. Contrast this with the 83 Billion budget cuts announced there last year which will lead to half a million job losses, cuts in social welfare, huge university fee rises and cuts to NHS services. The UK government had choices about who should pay for the capitalist's crisis. It hit the working class and left the massively wealthy alone. This is what class war looks like. In the USA, last September Forbes magazine released its annual list of the 400 richest Americans, and their combined net worth climbed 8% to $1.37 trillion. Contrast this with the number of people living in poverty in America, which rose by nearly 4 million to 43.6 million in 2009, the largest figure in the 51 years for which poverty estimates are available. The US has a current unemployment rate of over 16%, yet the ultra wealthy will not invest to create jobs in the economy, preferring instead to speculate on the bond markets. The rich continue to grow their wealth whilst the levels of poverty grow. This is what class war looks like. In Ireland, the top 300 wealthiest individuals have a combined wealth of 57 Billion, with their wealth increasing by 6.7 Billion in the last year. In 2009 (when the economy was nose diving into recession) 181 residents in Ireland each had investable assets of more than $30 million totalling 5.4 Billion. This wealth is not being invested to create jobs, and sits idly by in bank accounts. At the same time 440, 000 people are unemployed (14%) and 1,000 people are emigrating per-week in search of work. Almost 30% of young people under the age of 25 are unemployed. The Irish government has signalled that it will fight tooth and nail to retain a low corporate tax rate of 12.5%, not daring to touch the profits of MNC's that amounted to close to 30 Billion last year, most of which will be repatriated to their home countries. They insist on tying billions of bondholder debt like a noose around the necks of the working class, whilst at the same time implementing cuts in health, education and social welfare, hitting the working class hard, while leaving the rich free to grow their private wealth further. This is what class war looks like. In Greece, successive speculative market attacks on Greek bonds, raising their cost of borrowing to unsustainable levels, has left the country on the brink of default and revolution. The solution from the EU? To save its rotten system, the EU proposes a further 'bailout' for Greece, plunging the heads of the Greek working class deeper under a sea of debt that is not their own. Of course, "comments by Mrs Merkel and Mr Sarkozy signalled to banks and bondholders that they will not be made to incur losses on Greek debt." In Greece, like elsewhere, the working class will take the pain, while the wealthy remain untouched. This is what class war looks like!